Overlooking the Persian Gulf, Dubai is an emirate in the northeastern region of the UAE. A glitzy, glamorous city that attracts shoppers and urban vacation lovers, Dubai is soon becoming the tourist hub of the Middle East. Moving from the traditional oil industry, Dubai has now emerged as a major center for trade, commerce, finance, media, tourism, and fashion. Dubai’s philosophy is simple – what has not been endowed must be constructed. Little wonder then, that Port Jebel Ali, one of the biggest in the Middle Eastern region is also the world’s largest man-made harbor. 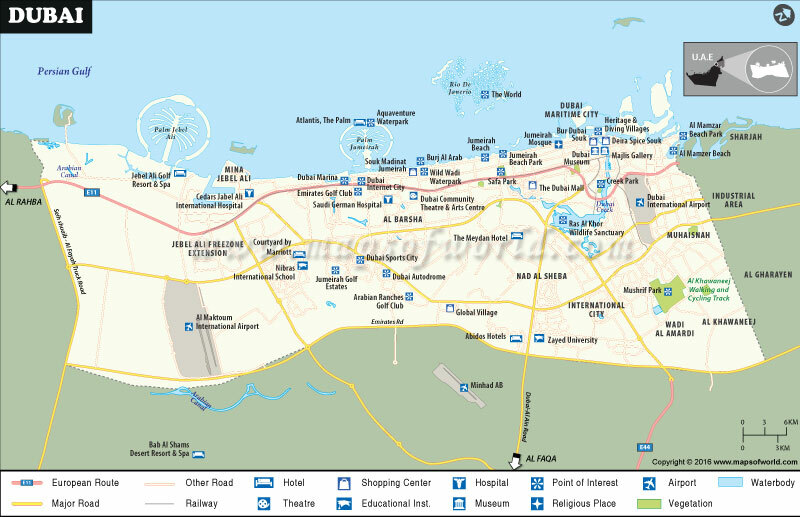 Port Rashid and Port Jebel Ali are major centers for maritime trade and commerce. The Dubai International Film Festival is now a groundbreaking exhibition of Indian and Arab films. Dubai is perhaps best known for its indulging entertainment options, for the many amusement parks and nightclubs and not the least for the Dubai Shopping Festival – a religion unto itself. Though archeological excavations in and around Al-Qusais date human settlement in the region to about 8000 BC, not much was known about the region till the European colonization of the 17th century. In 1833, Maktoum bin Butti led 800 members of the Bani Yas tribe to settle by the Dubai creek. What was already a prosperous trading port received a boost when Sheikh Maktoum bin Hasher al-Maktoum exempted the port from taxes on trading in 1894. The port’s and the city’s economic success was a result of the encouragement trade and development received from Sheik Saeed and Sheik Rasheed through the major part of the 20th century. In 1966 the discovery of oil provided a big boost to the economy. By 1971 Dubai and six other emirates joined to form the UAE. Despite the Gulf War of 1990, Dubai has returned to prosper and grow beyond what was once the dream of its rulers. With its sweltering heat and sharp humidity, it comes as little surprise that tourists plan their Dubai travel during the Fall, Winter and Spring months. November to April is the tourist high season – and indeed this is the time when the city’s mild climate seems best suited for sightseeing and for indulging in a variety of activities. In summers the city experiences over 11 hours of sunshine. June through September is the season to avoid – daytime temperatures can reach as high as 120°F but nights get very cool and can dip to about 80°F. May and October, though not very crowded, are equitable and pleasant. The Dubai Shopping Festival, a number of music festivals and cultural events are held over the winters and attract a huge number of visitors. The hotel and flights are cheap during the summer months but the heat makes it unviable to have any fun. The Dubai International Airport is probably the busiest in the Middle East Region. Built in the Al Garhoud district, about 2.5 miles south of Dubai city, the airport handles the arrival and departure of the city’s 9.3 million international visitors. The newly constructed Al Maktoum International Airport has the capacity to handle 120 million passengers each year. In and around Dubai you may want to take one of the 2100 buses that service over 140 routes in the city, including the air-conditioned buses. Taxis are by far the favorite means of transportation in the city. The red and green metro lines are fast and help you get across the city in a jiffy. The metro service of Dubai is the first urban train network in the region. The Burj Khalifa, the tallest structure on earth is probably the first place you will be referred to in Dubai. Do not miss out on a wonderful opportunity to catch the city’s panoramic skyline and click a few pictures from the observation deck on the 134th floor. Booking in advance may be a wise option, though. The Dubai Mall is the next best place in the city, the locals say. Do not be daunted by its vastness, the mall is meant to be as much an entertainment center as a shopping center. The Aquarium, the Dubai Fountain, the Kidzania, the Sega World, the restaurants, and the Dubai Fountain will leave you spoilt for choice. The Mall of the Emirates which houses the Dubai Community Theater & Arts Center, art galleries, the Dubai Theater, and an astounding range of shopping options is the next recommendation. Have you heard of a city within a city? Dubai Festival City is just that. Housing business establishments, residences, and entertainment centers are all part of this expansive city. Next do make a trip to Palm Jumeirah. The Palm Jumeirah, a man-made archipelago was created using the land reclamation technique. The Palm Jumeirah is the smallest of the three Palm Islands developed on the Persian Gulf on the Jumeirah coast. The Dubai Marina is a man-made marina built overlooking the Persian Gulf. One of the newest districts of Dubai city, the marina offers spectacular views besides housing over 120,000 people. Habtoor Grand Beach Resort right on the Dubai Marina is one of the favorite beaches in Dubai. Try the café at the RIVA Beach Club. Evenings here get very romantic with candles lighting up the club. Try the Club Joumana Beach at the Jebel Ali Golf Resort – besides sunning you may want to take a dip in one of the three pools and take one of the rides on offer here. Club Mina‘s beach at the Le Méridien Mina Seyahi is great for weekend beach parties. Dubai Marine Beach Resort at Jumeirah is well worth spending a day at. The resort complex offers a variety of sports, pool, spa, and other facilities. Get a private cabana at the Nasimi Beach at Palm Jumeirah for an ethereal experience at beach-lounging. Besides these, the beaches at Sheraton Jumeirah Beach Club, Pavilion Marina & Sports Club, and the Quay Club beach are best-loved by the locals. Traveling to Dubai with children and young adults can be a lot of fun. The Restless Planet, a dinosaur themed park is a great hit with children of all age groups. The park is working at introducing a number of edutainment options. Aquaventure at Atlantis, The Palm, is another very popular theme water park open to tourists. Do not miss out on Dolphin Bay, the nearby dolphin retreat. The Wild Wadi Water Park is possibly best loved by adults and children. Built next to the Burj Al Arab, this park offers a variety of rides and fun options including the White Water wadi, Wadi Leap, Flood River Flyer and Falaj Fury. Sega Republic Theme Park at the Dubai Mall has some high-power rides and is a completely indoor theme park. With over 150 attractions, the park has five themed zones – Speed, Adventure, Sports, Cyberpop and Redemption to entertain all ages. For family entertainment try the Wonderland Theme Park. From camel rides to 3 D movies to fun rides, the park has an entertainment center that is loved by the locals. Ice Land at Ras Al Khaimah with its Olympic sized lap pool and other water attractions also provides baby pools. The Dubai Museum, in the Al Fahidi Fort attracts over 80,000 visitors a year. The most extensive display of the history and culture of the Arab Peninsula is housed by the museum. The Gold and Diamond Park and Museum is one of a kind museum about the history of gold and jewelry making in the region. Besides the museum, the park has the offices of 118 gold jewelry manufacturers and retailers. Do visit the Dubai Car Museum for an extensive automobile display and the Antiques Museum to see and buy authentic Arab antiques. The Hatta Heritage Village is an ideal getaway from Dubai and takes you through the cultural heritage of the land. The Sheikh Saeed Al Maktoum House holds quite a display of the former ruler’s paintings and historic artifacts and is open to public. The Juma al Majid Heritage & Cultural Centre and the Sheikh Mohammed Centre For Cultural Understanding have been instrumental in cultural development and growth in the region. Souks in Dubai – Dubai is the land of Souks. The Gold Souk is perhaps the most famous. Lined with jewelry shops, this glittering souk is a delight. The aroma filled Spice Souk is next. Shop for some Ittar, the native perfumes, and natural fragrances at the Perfume Souk. The Ittars from this region go into the manufacture of some of the world’s best perfumes. The Textile Souk is next on our list. Raw silks, cottons, satins and voiles – and a riot of colors. Must visit. Besides these attractions, the traditional architecture of Dubai is best enjoyed by a visit to the mosques of the city. The Jumeriah Mosque is believed to be among the most beautiful in the world. The Grand Mosque and the Hor Al Anz Mosque are also known for their beauty and serenity. Among the top attractions of Dubai, the exhibitions and shows attract millions of tourists. The Arab Health, the Bride Show, the Dubai Shopping Festival, Cityscape Global, and PALME Middle East are among the best in the region. In Dubai fun is serious business. Here are some of the best–loved activities taken on by tourists. Dubai nightlife can get really glamorous and jazzy – all the more so if you decide to party on one of the floating nightclubs in the Dubai Marina. But if you like the idea of a floating dinner without the jazz of a party try a floating restaurant. A reservation on Bateaux Dubai or On Verra 6 is likely to be a romantic cruise down the marina and the Dubai Creek while enjoying a candle light dinner as well. Take a Segway tour and experience a new way to enjoy Downtown Dubai. Besides providing you a unique experience, get yourself clicked in the Segway, vaguely reminiscent of ancient Greek chariots. The Dubai Creek Golf & Yacht Club offers seaplane rides. Let the ride tickle your sense of adventure – take a city tour. Take a Dubai hop-on-hop-off tour in one of the swanky red city sightseeing buses and do not forget to spend time lounging by the Dubai Fountains, the tallest in the world. Ski and Dubai – yes, it is not too hot to ski at the Ski Dubai skiing resort – never. Enjoy the beautiful cityscape and take a walk across the Al Safa and Jumeirah Beach Park. The best activity you can indulge in when in Dubai is to take a safari into the desert, imitate the Bedouins, and camp in the wilderness. Jeep safaris into the desert and camel races are very popular in the desert. Spend a night at the Dubai Aquarium. Take a night safari and learn to dive underwater. Golf, skydive, kayak – but above all do not forget to shop. The shopping festival, the indomitable gold and spice souks and the gold vending machines – Dubai is all about shopping.